In 2009 the NIGC approved ATIG's request to operate the Casino Gateway Network in Indian Casinos nationwide. Our Indian Version of this revolutionary system is the Tribal Gaming Network. The Tribal Gaming Network (TGN) is a private gaming network that links Indian Casinos Nationwide. The TGN allows players to log-on to a network from Indian Casinos or homes on Indian Lands to play Wide Area Progressives Slots, Class III, Class II and Online Games that includes our Entertainment Plus and Entertainment to go products on Indian Lands. One exciting game featured on our network is Thunderball. Thunderball is the Indian Version of Powerball. It allows Indian Casinos over 30 States link together to create a Mega-Jackpot Lottery game. 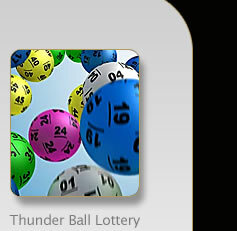 Thunderball will offer some of the largest Jackpots ever seen in a Progressive Lottery. Thunderball will be launched in 2012 ! A Sure Bet in Gaming Technology !